Dublin is brimming with history, culture, music and dance (you may have heard of locals James Joyce, Oscar Wilde, Samuel Beckett) and, yes, history has etched itself on the city over the last 2000 years? But how exactly are you going to fit that kind of sightseeing into one visit? 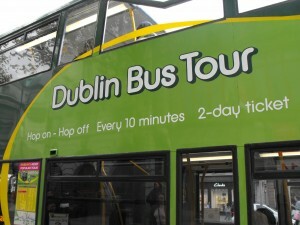 The Dublin Hop on-Hop off Bus Tour, that’s how. This is your golden ticket. This is how to see Dublin, your way, your time and minus the sore feet. And you won’t miss a beat. 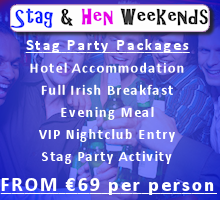 Along your merry tour, all of Dublin’s most loved talked about and essential attractions will show their face. From 9am, the tours operate daily. You can get on and off at any of our 33 stops dotted at the most popular sites around the city. Hop off for a snoop around Kilmainham Gaol and you’re free to hop on again for a visit to Christ Church Cathedral. Hop on-hop off. 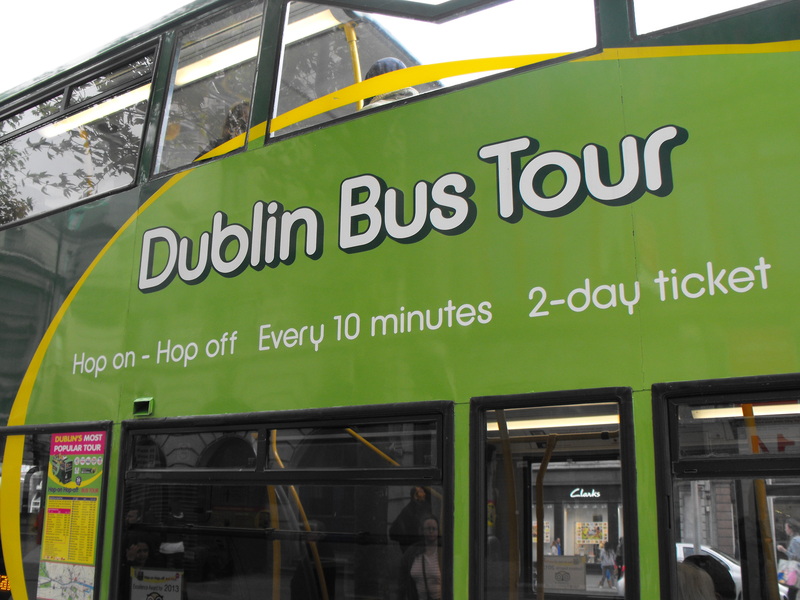 The Dublin Bus Tour has two exciting routes to offer – with just one ticket! The original route, which is a 90 minute tour, visits Dublin’s most popular attractions and has 24 great stops ideally located around the city. 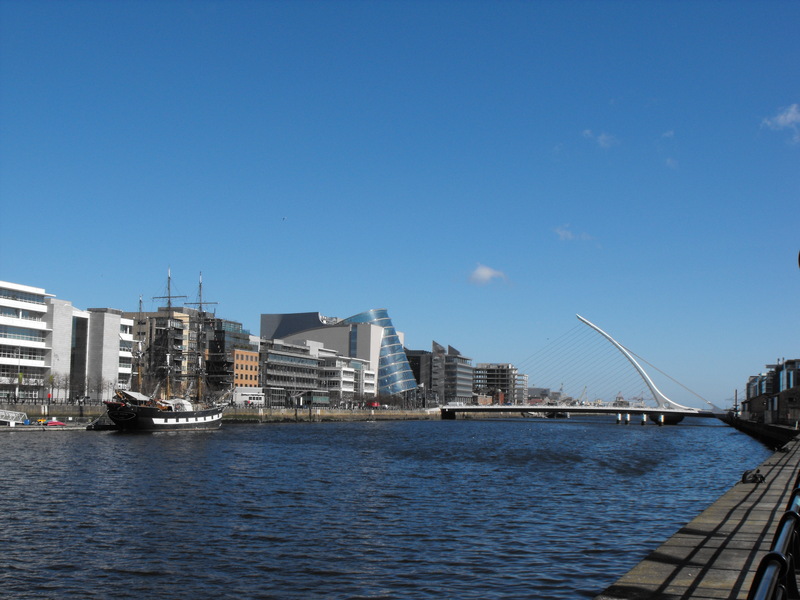 The Docklands route is a 35 minute tour which visits the Dublin Dockland’s area. This route has 9 stops ideally located at the most important attractions. The route showcases the fascinating history of this fabulous area of Dublin. Along the route, you will get the chance to see the wonderful U2 Graffiti Wall, the Jeanie Johnston Famine Memorial ship, and some magnificent architecture in an area which is becoming increasingly popular among visitors. At Stop 7 of the Docklands Tour, you can join the brilliant Dublin Bay Cruise for a voyage around the beautiful Dublin Bay to either Howth or Dún Laoghaire. We’re multilingual, too, with live commentary every 10–15 minutes and pre-recorded available in 10 languages operating every 30 minutes. The even better news is that your ticket is valid on both tours and we are giving you an extra day for FREE. Oh, and remember: kids go FREE (2 under 14 with a fare paying adult). Would you like to visit Lions, tigers and bears at Dublin Zoo? The golden Book of Kells? The cobbled alcoves of Trinity College? You got it. Getting thirsty? Hop off at the Guinness Storehouse for the porter story and a soothing sip. Think that’s tasty? The discounts at selected attractions will have you licking your lips. And who better than a local Dubliner to guide you through it all? It’s an unwritten fact that Dubliners invented charm. 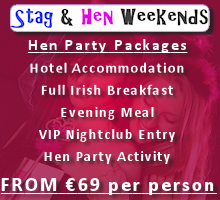 All our guides are Fáilte Ireland accredited and, at this stage, they’re attractions in themselves! If your legs need a stretch, why not try a walking tour delivered by one of Dublin’s best known historians. A Pat Liddy Walking Tour is a must do when in Dublin. It is normally €10, but it is available FREE to all Dublin Bus Hop-on Hop-off ticket holders! 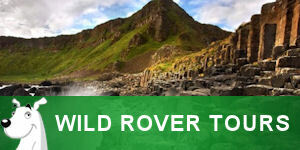 These doorstep tours can take you in comfort to the sea washed and mythological soaked shores of the Giant’s Causeway, watch as the sea washes over the hexagonal prints left by the great giants of Irish folklore. Journey to the Titanic Quarter in Belfast and browse over the now romantic story of the great ship Titanic etched in the chronicles of time by the great movie classic so beautifully acted out by Leonardo De Caprio and Kate Winslet. Whatever trip you take be that a coastal trip, and historical tour or a combination of both, you can be certain of safety, security and luxury as you get picked up on our doorstep and delivered to your place in time and history. Dublin Tours are often centred around a number of highly commercialised venues and attractions, however, if you don’t want to walk the beaten track, there are fantastic walks that allow visitors to Dublin to enjoy some of the magnificent history and culture of Ireland’s capital city. Wherever you are staying in Gardiner Street Dublin you can simply step out the front door and begin one of the most informative and scenic walks in Dublin. The first historic and architecturally important buildings that you will meet are the Custom House. 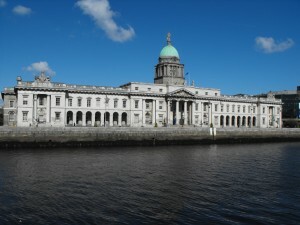 The Custom House in Dublin is regarded as one of the jewels in Dublin city’s architectural crown. A masterpiece of European neo-classicism it took 10 years to build and was completed in 1791. It cost the then not inconsiderable sum of £200,000. 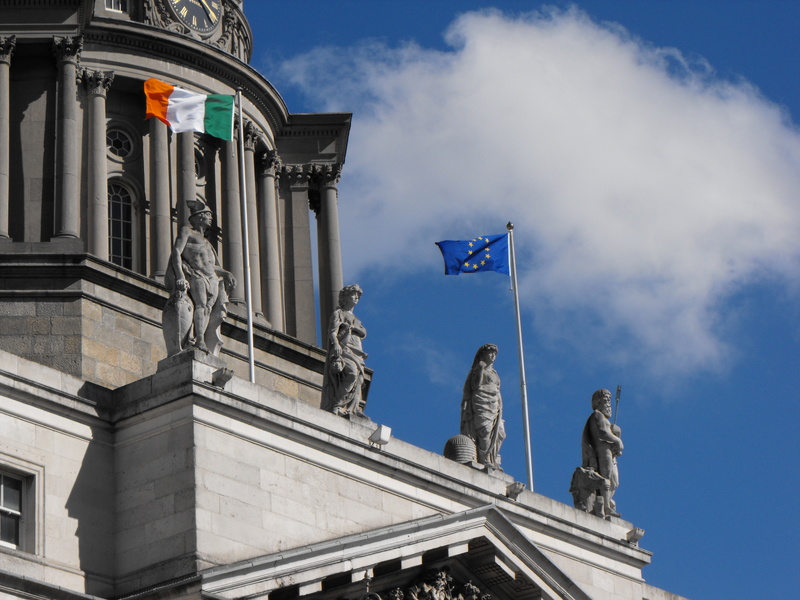 It was the greatest achievement of James Gandon who had been brought over from England to carry out the work. Gandon had been chosen by John Beresford, Chief Revenue Commissioner and a small coterie of the Irish ascendency who were then in the process of enhancing the streets and public buildings of Dublin. The sculptures which are located in various parts of the building were by the famous Irish sculptor, Edward Smyth. Initially the building was exclusively the headquarters of the Commissioners of Custom and Excise; however, by the beginning of the twentieth century, the dominant role of the Custom House was in relation to local government. The building was burnt to the ground on 25 May, 1921 during the Irish War of Independence; restoration work was completed by 1928. 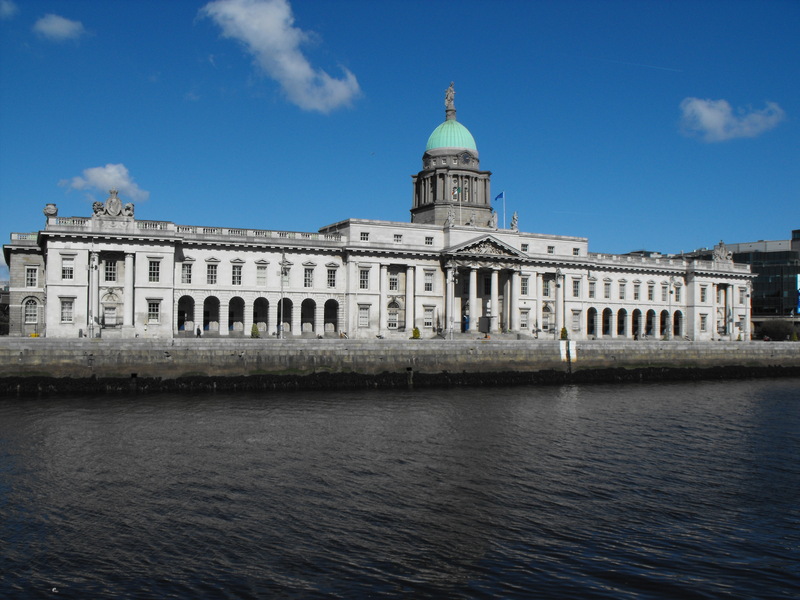 A second programme of restoration began in the 1980s and was completed in time for the bi-centenary of the Custom House in 1991. One of the Docklands architectural gems is the James Gandon-designed Custom House, one of Dublin’s finest 18th -Century buildings, completed in 1791. With its distinctive copper dome, the building is topped with the figure of Commerce, is classically proportioned and stretches for 114 metres along the Liffey quay. Keystone heads representing Ireland’s major rivers can be seen on all facades. ‘Famine’ (1997) was commissioned by Norma Smurfit and presented to the City of Dublin in 1997. The sculpture is a commemorative work dedicated to those Irish people forced to emigrate during the 19th century Irish Famine. 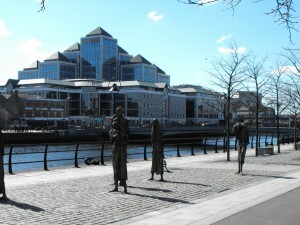 The bronze sculptures were designed and crafted by Dublin sculptor Rowan Gillespie and are located on Custom House Quay in Dublin’s Docklands. The World Poverty Stone is a commemorative stone marking the United Nations International Day for the Eradication of World Poverty. It is sited to the east of the Famine Sculptures on Custom House Quay in the heart of Dublin’s Docklands. This limestone memorial was commissioned as a gesture of solidarity with people living in poverty around the world. On the 17th of October 1987, in response to the call of Joseph Wresinski – founder of the International Movement ATD Fourth World – 100,000 defenders of human rights gathered in Paris to honour the victims of hunger, violence and ignorance, to express their refusal of extreme poverty and to call on people from all walks of life to unite to ensure respect for human rights. A commemorative stone proclaiming this message was inaugurated on this occasion on the Plaza of Human Rights and Liberties – where the Universal Declaration of Human Rights was signed in 1948. Since then, on the 17th of October each year, people from all walks of life, gather throughout the world to express their solidarity and commitment to ensure that everyone’s dignity and freedom are respected. On 22nd of December 1992, the General Assembly of the United Nations declared 17th October the International Day for the Eradication of Poverty. There are now over 30 replicas of the original stone now located around the world. These sites have become places of honour for people living in poverty in the world, places where people gather to reject the inevitability of poverty and social exclusion and places of friendship and solidarity where people from all backgrounds can gather together. Around the world, annual commemoration take place at the site of the stones to mark the 17th October UN International Day for the Eradication of Poverty. The artist – Stuart McGrath, based in Co. Wicklow, is a master craftsman; his training is in sculpture, architectural and classical stone carving. All of his stonecutting is done by hand using traditional methods. He also works in bronze. 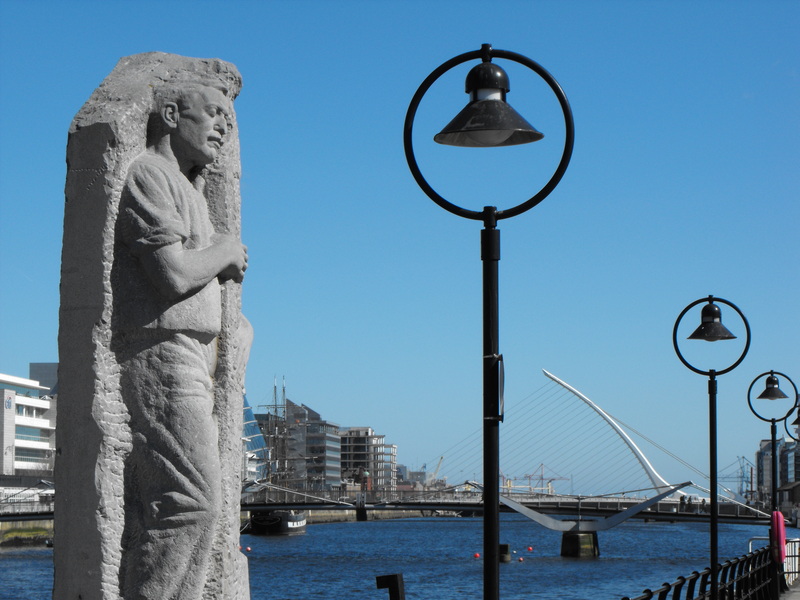 This memorial was co-commissioned by Dublin City Council, the Dublin Docklands Development Authority and ADT Fourth World. 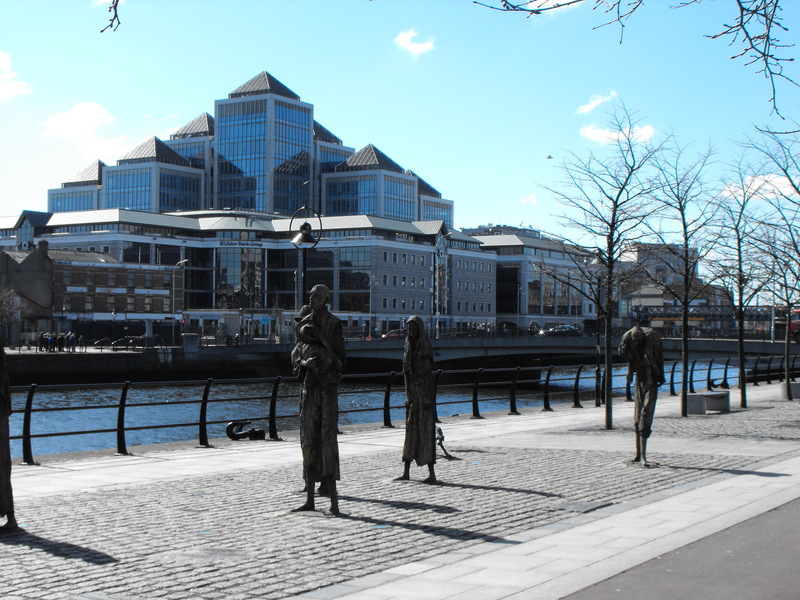 In contrast to the famine memorial is the modern multi-million Euro George’s Quay Plaza which is a complex of buildings located on the southern bank of the River Liffey between Hawkins Street and Lombard Street and which tower over the famine memorial. The Quay faces The Custom House, which is a major tourist attraction. The Quay is a centre for public transport such as Tara Street railway station (3rd busiest in Ireland) is located on George’s Quay. Office Use in George’s quay accounts for two thirds of all development. Although a lot of companies use the George’s Quay area the biggest is Ulster Bank, who have their headquarters here. 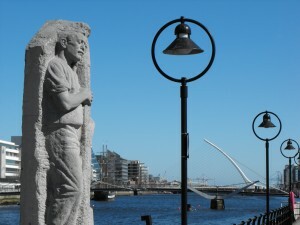 This sculpture was erected in 1988 – Dublin’s millennium year. It is a memorial to Matt Talbot (1856 – 1925) who is an icon for Ireland’s temperance movement. The sculptor – James Power – a native of Dublin was considered an excellent modeller in clay, plaster and wax and produced many superb portraits, death masks and genre pieces throughout his career. The sculpture is carved from granite and is located on SIr John Rogerson’s Quay in Dublin’s Docklands. Take a guided tour of the Jeanie Johnston (a replica tall ship) and hear the story of the Irish famine and emigration in the 1800s. The story of the Jeanie Johnston brings to life the daunting experience of the millions of people who crossed the Atlantic seeking survival and hope in the “New World” of North America. The tour conveys a deep sense of history and will to be a memorable experience for all who come on board. In addition, visitors have the opportunity to marvel at the skill, ingenuity and craftwork involved in re-creating this genuine replica of a wooden tall ship, one of the last of its type to sail the Atlantic in the 19th Century. The tours of up to one hour duration commence at 11am with the last being at 4pm (summertime hours). Meet your guide at the chq building where the tour commences and on then to the Jeanie Johnston which is docked just a few metres away down the quay. Following the visit to the ship, the tour concludes at the famine statues on Custom House Quay. Description: The Samuel Beckett Bridge linking Guild Street on the northside of the City with Sir John Rogerson’s Quay on the southside – west of Cardiff Lane / Macken Street is now open! It has 4 traffic lanes, cyclepaths and footpaths. Dublin City Council commissioned Valencian architect Santiago Calatrava – the world’s leading bridge designer – to create the Samuel Beckett Bridge which connects the north and south sides of the River Liffey halfway between the Seán O’Casey Bridge and the East Link Bridge. 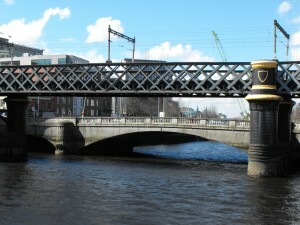 The brief called for ‘a landmark structure of unmistakable modernity and with a unique character that would provide a symbol at the maritime gateway of Dublin, similar to the manner in which the Ha’penny Bridge has become an icon for the city’. A Graham Hollandia joint venture constructed the bridge superstructure in Rotterdam. The bridge was delivered to Dublin on a 90m by 26m barge. The 628-mile journey took approx five days. The entire project cost €59.95 million. Funding came from Department of the Environment Heritage and Local Government, Dublin City Council and Dublin Docklands Development Authority. The Samuel Beckett Bridge is 120 metres long, with the curved pylon 48 metres above water level. It is cable-stayed and rests on a reinforced concrete support pier which has been constructed in the River Liffey and on abutments behind the existing quay walls. It has four traffic lanes (two running north and two running south), cycle paths and footpaths and weighs 5,700 tonnes. The bridge can rotate through an angle of 90 degrees to facilitate maritime traffic. Officially opened to traffic on the 11th December 2009, the Samuel Beckett Bridge links Guild Street north of the Quays with Sir John Rogerson’s Quay on the south. 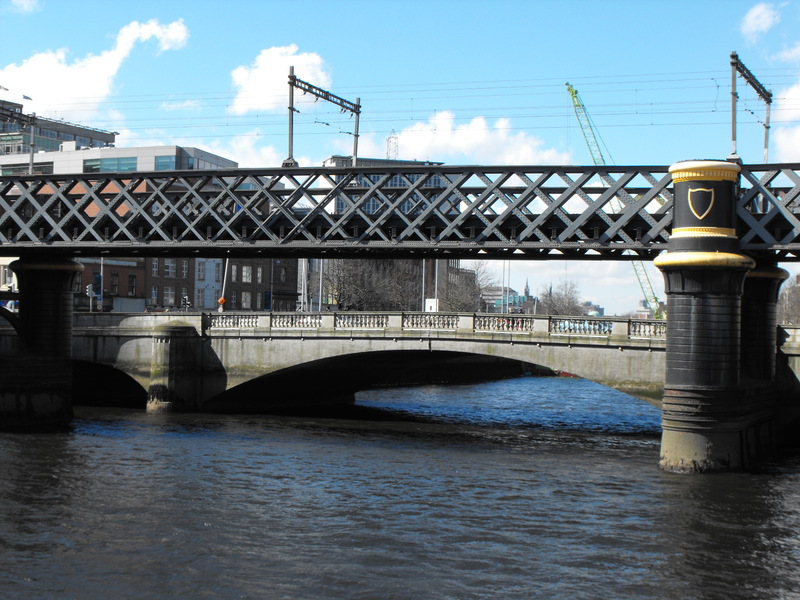 The Loopline Bridge (or the Liffey Viaduct) is a railway bridge spanning the River Liffey and several streets in Dublin, Ireland. It joins rail services from south of Dublin to Connolly Station and lines north. Designed by John Chaloner Smith (engineer to the Dublin, Wicklow and Wexford Railway), the bridge was built in 1891. It consists of wrought iron lattice girders on a double row of piers with five spans. The viaduct is approximately six metres above street level and supports two railway tracks. During original planning and construction (in the late 19th century) the project was subject to much opposition and controversy,because the structure blocks the view down river to The Custom House. However, the bridge was deemed necessary as a rail link between north and south Dublin, and to facilitate the movement of transatlantic mail coming from Kingstown (Dún Laoghaire) and Queenstown (Cobh). 100 years later, the visage of the bridge remains the subject of some debate. Already arguably less attractive than some of Dublin’s other bridges, the façades of the Loopline have been used by Iarnród Éireann for billboard advertising. 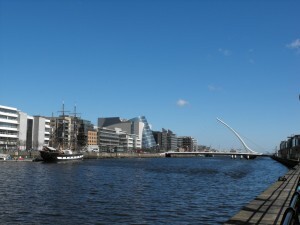 As of 2006, the company has scaled back the bridge’s use for this purpose to reduce impact on the city skyline, following input from An Bord Pleanála and Dublin City Council.